This is the best way to smoke ribs as well as a great rub for ribs that’s salty and sweet so you don’t even need barbecue sauce. Which cuts of meat make the best ribs and the trick to get them fall off the bone tender when you’re smoking ribs at home. 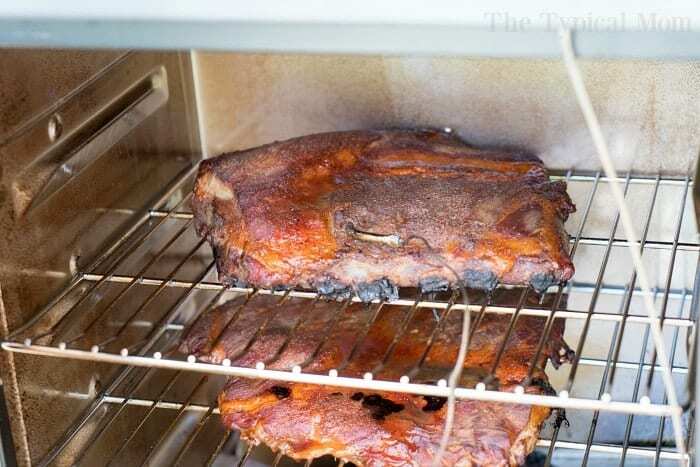 One of our all time favorite easy smoker recipes. 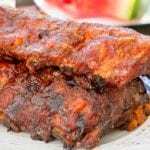 It’s the summertime and you may be looking for the best way to smoke ribs and we have it!! We use an electric smoker but the same would hold true for traditional smokers as well. 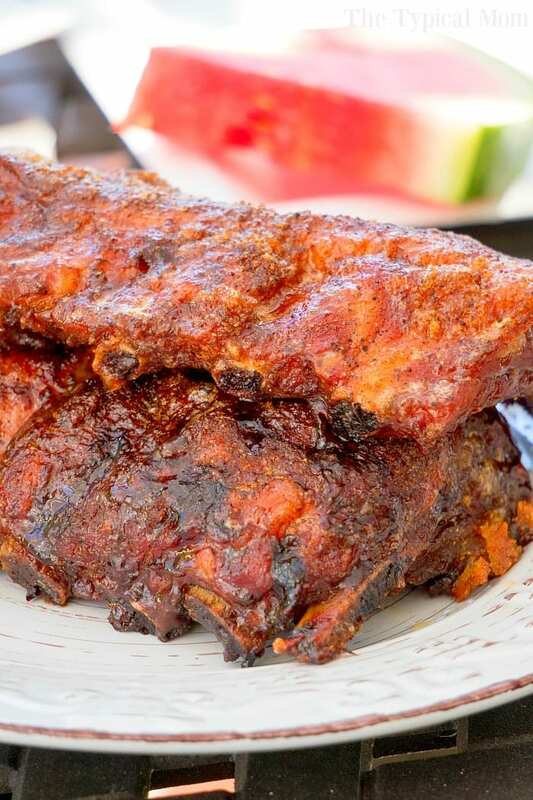 We’ve got tips and tricks to smoking ribs slowly and the best rib rub recipe ever. If you’re new to smoking meats we also have a step by step tutorial for how to smoke meats too. If your mouth is watering when you look at this picture above we’ll show you how to make them! It’s one of our favorite easy smoker recipes. They are our all time favorite dinner ever! Then you’ll need to remove the membrane from ribs so they’re ultra tender when done. Now we can go into specifics of the best dry rub for ribs and reiterate the directions shown in the video. As he states you want to get a really thick layer of rib rub on the top and the bottom, yes both sides for sure! Some will fall off in the cooking process but most will stick and caramelize while you’re smoking your ribs. The key to smoking in general is a great dry rub and cooking it at a low temperature for a longer duration of time. Don’t rush it, slow and steady wins the race on this one for sure. Start these in the morning if you want them for dinner. 1 rack is usually just enough for the 5 of us and yes my girls finish each one eating the bones dry. I usually love a lot of barbecue sauce on meats but I literally use none when my husband makes this dry ribs rub and coats them well. It’s a salty and sweet flavor that you can heat up with more pepper and/or chili powder but the rib rub below is mild as far as heat goes. This is the best way to smoke ribs as well as a great rub for ribs that's salty and sweet so you don't even need barbecue sauce. Which cuts of meat make the best ribs and the trick to get them fall off the bone tender when you're smoking ribs at home. 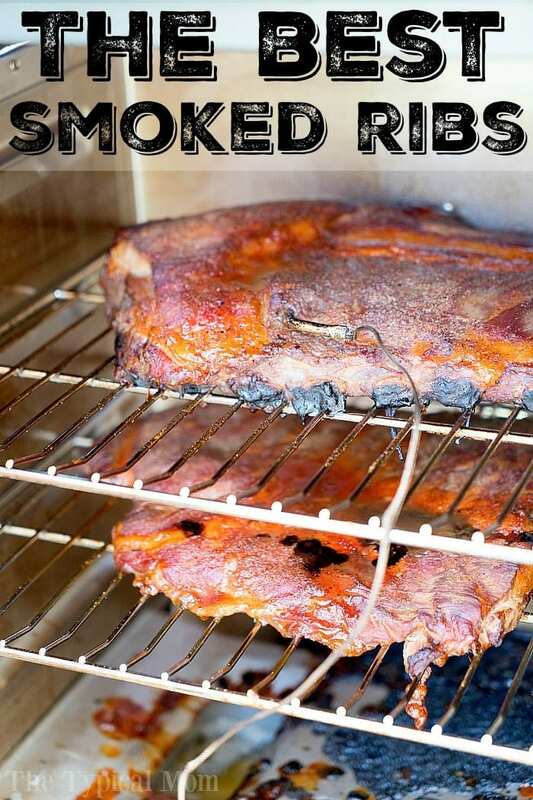 One of our all time favorite easy smoker recipes. Rinse ribs, pat dry and remove the membrane from the back of the ribs to make them more tender. Mix all spices in a bowl well. Set smoker to 180 degrees and lay 1/2 rack on top rack and 1/2 rack on lower rack. Use temp. probe if desired to reach 145 min. degrees internally, or check after about 5 hours to check. Depending on size of ribs ours usually take 6 hours to look as the picture does with rub caramelizing and meat is pulling away from the bone which means they're done and they will be tender.